A coin is a symbol for something we value. 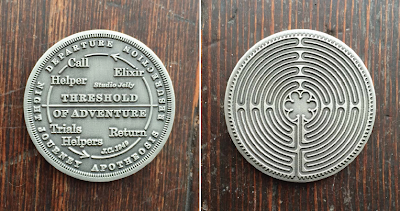 This coin represents the work we do at the studio. Each side features a map that helps us penetrate and understand the human adventure and our quest to discover and live our full potential. 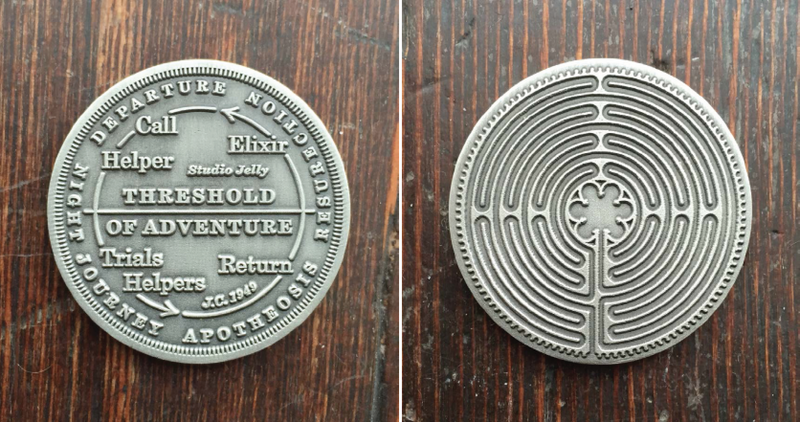 One side of the coin features an adaptation of Joseph Campbell's map of the hero's journey. The other side features the labyrinth design from Chartres Cathedral. Some older blawg posts say more about how and why Campbell and the Chartres labyrinth have been important to me. Our Souls want to be born. We are invited to actively and intentionally participate in this birth. We are called to ask: How can I go inward, and discover something sacred in myself, and bring it to the world, and thereby bless the world? That's what these maps are about. Helping people do that is the work that we value.